booking seven days a week including bank holidays unless otherwise noted on our website or by one of our customer consultants. The company is fully licensed, registered and insured. The cleaning systems we use are perfectly safe and suitable for all natural and synthetic fiber carpets and sofa finishes/upholsteries and will not cause any mechanical or chemical damage to fibers, colorfastness, dimensions or any other visual and comfort properties. Our products and equipment are highly effective in the lifting of stubborn stains and removal of soiling, specialized antibacterial treatments can also be performed. We can carry out steam as well as dry cleaning for carpets and upholsteries – we are qualified and experienced in both types of cleaning, and able to yield industry standard results without the risk of damage. All of our work is performed using industry certified supplies and professional grade machines. Our technicians are highly skilled and experienced ensuring fast and efficient cleaning service without errors. Steam and/or dry cleaning can be carried out on a regular basis/as often as necessary with no risk of damage or alteration to fibers/materials. 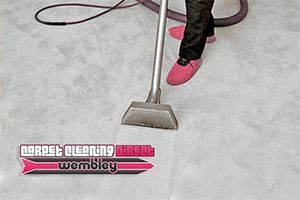 With Carpet Cleaning Wembley you get to choose from a range of versatile and efficient cleaning treatments for carpets, rugs, runners, upholsteries, and sofas. We also offer other solutions to help you keep your home or office clean and fresh with minimum cost and no hassles. Here are some of our most popular services at a glance. Carpet Cleaning – our specialty, of course, a professional cleaning treatment specially designed to deliver the best possible results without the risk of damage to fibers and their properties. Suitable for all types of natural and synthetic fiber carpets/rugs. Carried out using professional grade equipment and materials. Sofa & Upholstery Cleaning – specialized cleaning service for more delicate sofa finishes and upholsteries. The process is safe and suitable for different types of finishes and materials, will not cause visual or physical alteration to colors or texture. Highly effective for stain and odor removal. Mattress Cleaning – professional sanitizing for mattresses, work effectively on all types/size mattresses, delivers excellent results on all sides of the mattress including the bottom. Uses natural cleaning power of steam to remove odors, staining, and soiling. Can be performed on a regular basis. Curtain Cleaning – full steam cleaning of the curtains, which purifies them deeply, without even unhanging them. One Off Cleaning – an effortless holiday for you, while our cleaners visit your home and clean around for the time booked, service is customizable under your desires and needs. "I think that these guys are hands down the best cleaners in London. They came on a short notice as we had a nasty spill of BBQ sauce all over the carpet in the living room." "Carpet cleaning has always scared me as I have no clue if it may damage the carpet, but it turns out it’s completely safe and quick way to get the build up grime out of the carpet. The results can be seen!" "Thank you for being so professional and helpful! I felt no smell and I saw no mess when my curtains and mattress were cleaned. 5 out of 5 stars!"